It is Wednesday and that means another Hills R Us ride. This weekly ride is co-listed by both ACTC and Western Wheelers bicycle clubs. Today the route is what we call the Coastal Classic, one of the more popular of the routes. 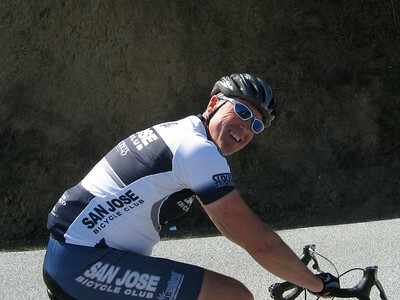 It starts in Los Altos and includes 57 miles, considerable climbing, and some beautiful vistas. We first head out through the valley to Portola road. It was a slight downhill so Ann and I were blazing down on the tandem and a few of the 15 or so riders were able to catch a ride before the train left the station. At Old La Honda we made a left turn for our first real climb up to Skyline. Western Wheelers uses Old La Honda as a benchmark climb so I did a time check of our climb and we did it in 28 minutes, faste enough to be a “D” rider. Unlike school, a “F” is the best grade and an “A” rider is the slowest so this time getting a “D” was pretty good, especially considering we were climbing on a tandem. After making the climb we went down the other side of Old Lahonda to highway 84, were we headed for a gradual but fast descent to San Gregorio for a stop. Ann enjoyed their date bars and Franz one of their chocolate chip cookies. From there we made a climb up Stage Road up to Highway 1. Ann grabbed the camera and took these photos from the back of the tandem of some of the riders. Michael K., the ride leader. 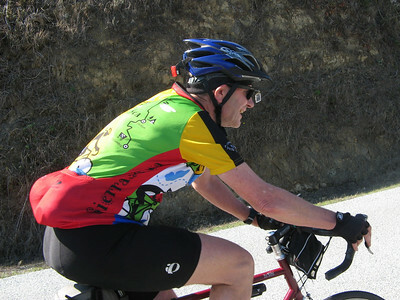 Bill K., a member of ACTC who does several bike tours each year. 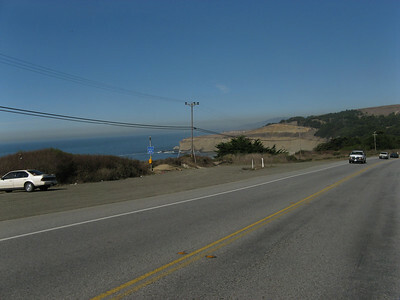 Once we reach the coastal highway, we headed down a nice descent and reached a speed in excess of 35 miles per hour. Ann must be feeling much safer on the back of the tandem because while we were moving so fast she took the camera out and took this picture of the Pacific Ocean. Gee riding without holding on the handlebars at that speed! We on Highway 1 for only a short while before we turned to head up Tunitas Creek, the most difficult climb of the ride. 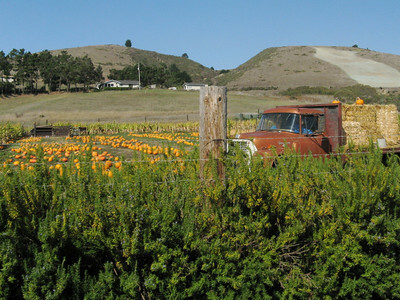 Near the bottom we saw this pumpkin farm. It was then a 7 mile climb, going from sea level to 2,o00 feet. We kept up the pace until we reach Skyline for a regroup to wait for the rest of the riders. Then it was down Kings Mountain, through the town of Woodside, then back to the start. The weather was fantastic, even over by the ocean. It was a great ride. Yesterday Ann and I went on a long tandem ride. It was the last chance Ann would have to ride before leaving this morning for Sara’s house for a visit. We decided to first head up Croy. I wanted a long down hill so I could check out the new drag brake we had installed on our tandem. Ann was so happy to be out riding the bike that she could not resist giving me a kiss. Okay, so the picture was posed, as was this one that we took in front of a tree that was starting to show it’s fall colors. As we went back down the canyon, I tried out the new drag brake. It has a bar end shifter that you can click through several settings, each adding more drag. I must say that I put it on maximum drag and still had to brake, and Croy is not that steep. But I guess it is worth having. We then headed out to Bailey, then back toward Morgan Hill. We went up Willow Springs, along Oak Glen and then back over Llagas. Aw we were descending down I was suddenly stung by a bee, right above the left eye. I had to stop right away. Ann could not see the stinger to pull it out. 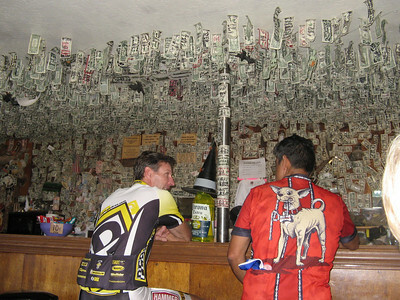 With nothing to do but go on, we biked to Erik’s Deli in Morgan Hill to eat lunch. Then it was back home for a total of 56 miles. A very good ride, not counting the bee sting. When I got up this morning, my eye was all swollen. I didn’t expect to have that much of a reaction. I could still see well enough to drive Ann to the airport and later to do a bike ride. But the swelling is quite visible. I hope it gets better real quick since I have a major bike event this weekend, that I have to ride, rain or shine.